"Dauphin of Viennois" redirects here. For the heirs to the French throne, see Dauphin of France. Coat of Arms of the Dauphins of Viennois. The Counts of Albon (Comtes d'Albon) were members of the medieval nobility in what is now south-eastern France. Guigues IV, Count of Albon (d. 1142) was nicknamed le Dauphin or the Dolphin. His nickname morphed into a title among his successors. By 1293, the lands ruled by the Counts Albon, the old comitatus Albionis, were known as the Dauphiné of Viennois (Dalphinatus Viennensis). The titles and lands had been part of the Holy Roman Empire since 1032. They passed to Philip VI of France in 1349 on condition that the heir to the French crown always be named Dauphin, and be personal holder of the lands and titles. By condition of the Emperor, the Dauphiny could never be united to France. When the King of France had no son, he would personally rule the Dauphiny separately, as Dauphin. Thus, the province technically remained in the Holy Roman Empire even after 1349, and it was administered separately from France well into the early modern period; it was incorporated into France only de facto with the rise of absolutism, in the 17th century. Robert V, Count of Auvergne married Marquise d'Albon, a daughter of Guigues IV. Their descendants adopted the title of Dauphin of Auvergne, and it was used by some as the family name. Humbert II sold his lands and titles to Philip VI of France. ^ Bernard Bligny (1984), "Note sur l'origine et la signification du terme "dauphin" (de Viennois)", Actes des congrès de la Société des historiens médiévistes de l'enseignement supérieur public, 15ᵉ congrès, 15 (1): 155–56 . 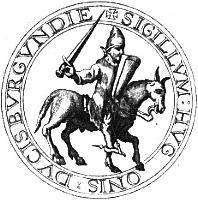 Guigues VII (1225–1269), of the House of Burgundy, was the dauphin of Vienne and count of Albon, Grenoble, Oisans, Briançon, Embrun, and Gap from 1237 to his death. He was the son of Andrew Guigues VI and Beatrice of Montferrat. When his father died, his mother helped guide the leadership of the new Dauphin. Humbert II de la Tour-du-Pin was the Dauphin of the Viennois from 1333 to 16 July 1349. He was a son of the Dauphin John II and Beatrice of Hungary. Humbert was the last dauphin before the title went to the French crown, to be bestowed on the heir apparent. Andrew Guigues VI, known as André de Bourgogne, Dauphin of Viennois, was the Count of Albon, Briançon, Grenoble, and Oisans from 1228 until his death. He was the son of Hugh III of Burgundy and Béatrice of Albon. He took his regnal name after and inherited the titles and lands of his maternal grandfather, Guigues V.
Jean II de la Tour du Pin succeeded his father Humbert I as dauphin of Viennois from 1306 to 1318. His mother was Anne of Burgundy, dauphine du Viennois. 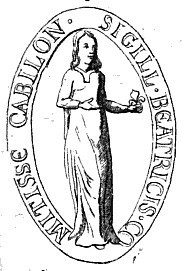 Béatrice, Countess of Albon and Dauphine of Viennois (1161–1228) was ruling countess and dauphine in 1162-1228, in succession upon the death of her father Guigues V.